Red Lion Hotel San Angelo invites you to experience West Texas like a true local when you stay in one of our spacious guestrooms. Enjoy the thoughtful amenities such as complimentary Wi-Fi and continental breakfast that make for the ideal trip away from home. Business travelers will appreciate the convenience of a business center located in the hotel while our enclosed pool and hot tub make the perfect accommodation for your next family vacation. We offer over 4,000 sq. 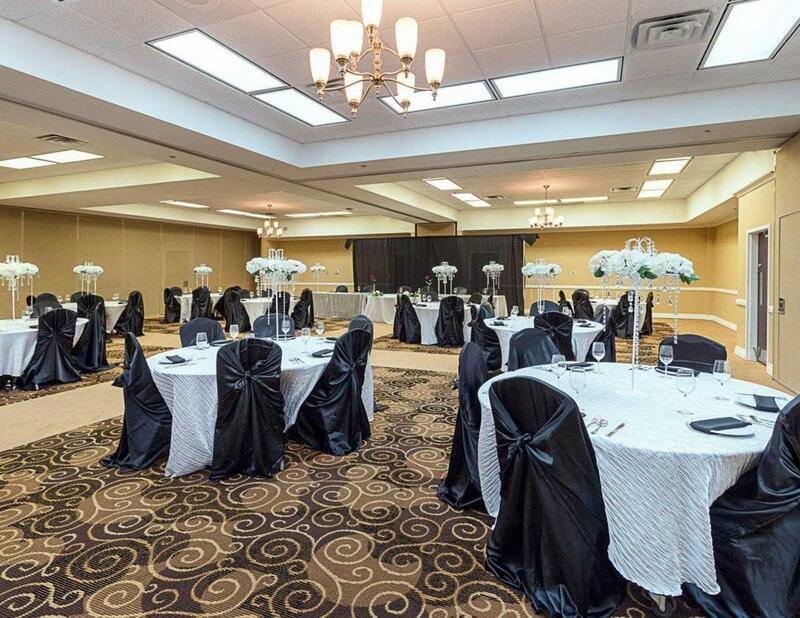 ft. of flexible meeting and event space as well as a vast array of delicious catering options available through our onsite restaurant, Black Sheep Bar & Grill. Conveniently located just off I-67, we are steps away from the McNease Convention Center and Concho River. The Texas Bank Sports Complex, Fort Concho and the heart of downtown is also within short proximity to the hotel. The city’s center includes shopping, entertainment and restaurants that the entire family can enjoy. Our small-town hospitality, central location and thoughtful amenities make Red Lion Hotel San Angelo the perfect headquarters for your next journey. Feel at home from the moment you step foot in our Red Lion hotel with our selection of signature amenities and features. Guests of Red Lion will enjoy the thoughtful details of our West Texas hotel that make traveling for business or pleasure a breeze. Amenities like our San Angelo, TX hotel fitness center, seasonal pool, complimentary breakfast, and more, let you relax and enjoy a stress-free trip away from home. When you stay at Red Lion Hotel San Angelo, enjoy great food that's never too far. Each morning, start your day with a delicious and hearty breakfast. For all your other meals, get a taste of the local flavor at the popular area restaurants near our San Angelo hotel. Try out some of our favorite restaurants in the local San Angelo area. Enjoy complimentary breakfast at Red Lion, prepared daily. Fuel your day with a fresh and hearty breakfast in San Angelo. Guests of Red Lion Inn & Suites can enjoy a complimentary breakfast each morning. Our delicious daily spread offers the perfect start to a full day of exploring San Angelo. Experience San Angelo’s most popular local cuisine during your stay at Red Lion Hotel San Angelo. From authentic Mexican to southern comfort food, there’s plenty of great dining to be found near our hotel. Experience true Southern hospitality at the Black Sheep Bar & Grill. Located on-site, this local restaurant offers home cooking perfect for the whole family. Get local at our favorite sports bar & night club. Located minutes from our hotel in San Angelo, TX. If you’re looking for a more upscale dining experience in San Angelo, look no further than the Angry Cactus. This bar and grill is located in the heart of downtown and has quickly become a local landmark. At Red Lion Hotel San Angelo, we are proud to offer our guests a collection of flexible meeting and event space in addition to special booking rates for groups. Our 4,166 square feet of available event space, comprised of five total rooms, is perfect for hosting anything from an important business meeting to a fun social gathering. Save on room blocks when you inquire about group rates on our 147 guest rooms . To learn more about our group rates and San Angelo, TX event spaces, contact us at (325)-658-2828, or Email us. We look forward to speaking with you soon! Experience San Angelo to the fullest during your stay with Red Lion Hotel San Angelo. Tour the city and experience its culture when you explore the top local attractions, attend popular events, and discover hidden gems. View our guide below for the best things to do in San Angelo, TX. Explore San Angelo with ease using our guide to popular area attractions. See all San Angelo has to offer when you attend popular local events during your stay with Red Lion. From great shopping and food to unique cultural experiences, you'll definitely want to check out these lesser-known San Angelo attractions. Discover all there is to do in West Texas when you stay at Red Lion Hotel San Angelo. Whether you spend the day exploring the historic downtown area or enjoy a one-of-a-kind experience at the San Angelo Rodeo, there is plenty of fun to be found in our city. Plan your visit to San Angelo using our local attractions area guide. Historic Downtown San Angelo offers residents and visitors to the city a unique mix of modern art and Western heritage. Stroll the sidewalks of Concho Avenue and feel transported in time. Many of the buildings along this street feature the original facades from the 1800s and 1900s. Established in 1867, Fort Concho was originally created to protect frontier settlements and patrol the West Texas region. Today, Fort Concho National Historic Landmark still retains much of its former post and includes original and restored fort structures. Experience a San Angelo tradition unlike anything else at the San Angelo Stock Show & Rodeo. Both the stock show and rodeo date all the way back to the 1930s and showcase the classic culture and history of West Texas. Formerly a Coca-Cola bottling plant, this transformed space now stands as the San Angelo Performing Arts Center. Enjoy a variety of performances including dance, music, theater, as well as keynote speakers at this popular San Angelo event venue. Immerse yourself in the local San Angelo culture during your stay with Red Lion. With exciting events held year-round, there is never a shortage of things to do in our West Texas home. Browse through some of our favorite annual events below. Enjoy Fort Concho’s largest annual event held in the first full weekend of December. Christmas at Old Fort Concho kicks off the holiday season and transforms the fort’s 40 acres into a winter wonderland complete with shopping, entertainment, food, children’s workshops, a visit from Santa, and more. Celebrate our nation’s Independence Day at the 4th of July Pops Concert. This annual event offers viewers patriotic music performed by the San Angelo Symphony, a military march-in, Fort Concho cannons, and, of course, a fireworks display. The 9th Annual West Texas Tattoo Convention is coming to San Angelo February 23 - 25th 2018. Sometimes a city’s best destinations are found off the beaten path. From great shopping to even better food, explore our list of San Angelo, TX hidden gems to discover some of the best, lesser known things to do during your stay with Red Lion. Located in Christoval, Texas, just 10 minutes outside of San Angelo, is Mount Carmel Hermitage. Enjoy mass on Sundays at 10am or walk the beautiful grounds during your visit. Enjoy classic Tex-Mex fare at local favorite restaurant, Henry’s Diner. Head over to Henry’s for a drink and some deliciously authentic Mexican food, just minutes from our San Angelo hotel. While there may not be any chickens, the Chicken Farm Art Center offers plenty of local art in these refurbished farm buildings. Events are held here every month, so be sure to see what’s on during your stay in San Angelo.